Campylobacter, Salmonella, Cryptosporidium and Giardia cause diarrhoeal illnesses in thousands of people annually in New Zealand. The incidence of these infections is significantly higher in New Zealand compared to most other developed nations. Animal, environmental and waterborne sources are a common cause of isolated illnesses and outbreaks, and exposure to these sources is a significant risk-factor for infection. This edition of the rural infections series focuses on these four notifiable pathogens, each of which causes a similar set of symptoms, and discusses the investigation and management of diarrhoeal illnesses in a person with rural occupation, residence or recent contact with animals or untreated water. Campylobacter, Salmonella, Cryptosporidium and Giardia represent four of the five most frequently notified illnesses in New Zealand (pertussis is the fifth).1, 2 From July to September, 2013 (the most recent surveillance period*), these four pathogens caused a total of 50 outbreaks and approximately 2880 confirmed illnesses.2 Rural occupation, living in a rural area or contact with farm animals is a significant risk factor for contracting these infections; approximately 10% of the notified cases in the reporting period were traced to an environmental, animal or waterborne source.2 Any illness caused by these four organisms is notifiable to the Medical Officer of Health. Campylobacter, Salmonella, Cryptosporidium and Giardia cause clinically similar illnesses, typically profuse diarrhoea, abdominal pain and nausea, with or without vomiting (Table 1). Bloody diarrhoea, fever, malaise and a range of other symptoms may also be present. The patient’s gastrointestinal symptoms usually last less than two weeks before resolving spontaneously, however, Cryptosporidium and Giardia can cause persistent or chronic diarrhoea in some people. Viral infections and E. coli (VTEC) are also common causes of diarrhoea in all patients. Patients with Campylobacter, Salmonella, Cryptosporidium and Giardia infection will typically present to primary care with diarrhoea. History and examination is generally sufficient to establish a working diagnosis and appropriate management. If the patient reports large-volume, watery or bloody diarrhoea with diffuse abdominal pain, enteric bacterial infection is likely.10 In a person with a rural occupation, residence or recent contact with animals, Salmonella, Campylobacter, Cryptosporidium and Giardia are among the most likely causes, but other, more general causes of diarrhoea should also be considered, which would apply to patients in any setting. If the patient’ symptoms have occurred within six hours of ingestion of potentially contaminated food, food poisoning with pre-formed bacterial toxins (i.e. toxins that are present in the food and cause symptoms in the gut, rather than the bacteria themselves) should be suspected. However, the source of infection is not always apparent, or symptoms may occur coincidentally following ingestion of high-risk foods without being related. Non-infectious causes of diarrhoea should also be considered. Patients with small-volume, bloody diarrhoea, lower abdominal cramping and tenesmus (feeling as though they constantly need to defaecate or that the bowel is not completely empty following a bowel movement), may have inflammation of the bowel due to a conditions such as coeliac disease or inflammatory bowel disease. Family history and the duration of symptoms may suggest non-infective causes; however, first presentations of these illnesses can be difficult to differentiate from an acute episode of infectious diarrhoea. *Incidence data are from July, 2012, to June, 2013. **Change in incidence from December, 2009, to December, 2013. Escherichia coli are common bacteria in the human gastrointestinal flora, and are not usually pathogenic. However, overgrowth and certain strains of E. coli can cause severe diarrhoea. 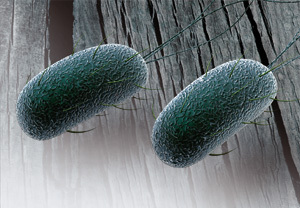 The incidence of illness related to E. coli in New Zealand is significantly lower than that caused by Campylobacter, Salmonella, Cryptosporidium or Giardia. Infections often have an environmental or animal source; from July to September, 2013, there were five environmental, animal or waterborne outbreaks.2 Food-borne illness also occurs, particularly following ingestion of contaminated meat. E. coli itself is a causative pathogen in cases of notified gastroenteritis. Gastroenteritis is a notifiable illness if there is believed to be a common source or if the person with the illness is in a high-risk category, such as a food handler. In such a case, E. coli will be added retrospectively as the causative organism, if identified through laboratory testing. Laboratory investigation is not routinely required for patients with acute diarrhoea. However, in a patient with a rural occupation, residence or recent exposure to animals, laboratory investigation is recommended to provide additional information to guide treatment and for notification purposes. What tests should be requested for a patient with rural risk-factors? Note the patient’s relevant risk factors, e.g. rural occupation, on the laboratory request form, as the test may be declined by the laboratory if justification for testing is not recorded. The faecal culture and microscopy test is used to assess a patient’s stool for leucocytes, indicating inflammation of the bowel either due to an invasive pathogen or other inflammatory bowel disease and isolation of pathogenic bacteria. This is the first-line test for the investigation of infectious diarrhoea in someone with risk factors. It can identify Campylobacter, Salmonella, Yersinia, E. coli (VTEC) and Shigella. Ask the patient to provide a faecal sample in a sterile collection container. The sample should be stored at room temperature and should not have a fixative applied to it. The sample should be transferred to the laboratory as soon as possible. If transfer will be delayed by more than 24 hours, refrigerate the sample and consult the collecting laboratory. The Giardia and Cryptosporidium antigen test is an immunoassay test that identifies the presence of antigens from Giardia and Cryptosporidium in a patient’s stool. The results will be reported as either positive or negative, i.e. antigens are present or absent. As with faecal culture, an antigen test requires a fresh faecal sample. The same sample used for bacterial culture is used for the antigen test. Microscopy can be used to detect Giardia and Cryptosporidium, in samples from patients with acute diarrhoea, however, it is not routinely recommended. Microscopy is an alternative, second-line option in a patient with a negative antigen sample but ongoing symptoms. Microscopy requires a high degree of technician skill, has a slower turnaround time and requires up to three serial samples in order to provide sufficient sensitivity, which decreases patient compliance and increases the cost of the test. Other methods of detecting Giardia and Cryptosporidium such as microbial stains and enzyme immunoassays are available in some laboratories, but they are not routinely recommended. Stains require a different sample, with a fixative applied to the stool; this type of test would generally only be requested in consultation with an Infectious Diseases Specialist. It has been suggested that real-time polymerase chain reaction (PCR) will eventually become the standard test for investigating infectious diarrhoea, due to a faster turn-around time, and may replace antigen testing.16 At present PCR is not routinely available for investigating infectious diarrhoea. In October, 2013, the Laboratory Test Schedule and accompanying referral guidelines were released. DHBs can implement the guideline individually. All available laboratory tests have been categorised into two groups, termed Tier One and Tier Two. Tier One tests can be ordered by any clinician, Tier Two tests are limited to a list of named specialists. 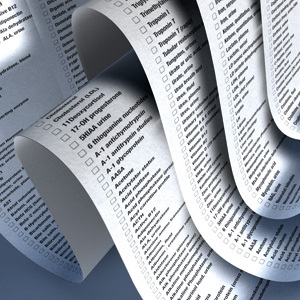 Guidelines for the appropriate ordering of selected tests were also developed. Both faecal culture and Giardia and Cryptosporidium antigen test are funded Tier One tests in the Laboratory Schedule. For further information, see: “The New Zealand laboratory test schedule and guidelines: What does it mean for general practice?”, Best Tests (Nov, 2013). When should a patient be referred to hospital? Most patients with infectious diarrhoea can be managed at home. However, referral to hospital should be considered for patients with persistent vomiting who are unable to retain oral fluids or who have severe dehydration. Referral should be considered for older patients who are unable to manage at home by themselves or younger children whose condition may deteriorate rapidly.12 Some practices, particularly rural practices, may be equipped to manage patients with dehydration with IV fluids and monitoring, rather than referring to hospital. For further information, see: “Community-based IV administration: primary care reducing hospital admissions”, BPJ 38 (Sep, 2011). Infants and children without signs of clinical dehydration, should continue breast feeding and other milk feeds as normal. Older children should be encouraged to drink regularly, in small amounts.18 Oral rehydration solution can be offered as a supplemental fluid.18 Oral rehydration solutions can be made at home (see recipe below) or prescribed, fully-subsidised. Drinking undiluted fruit juices or carbonated drinks should be discouraged,18 as they contain high levels of sugar, and can increase dehydration through diuretic action and by altering the osmolality of the gut. In adults with a diarrhoeal illness, oral rehydration solutions are not usually required. However, patients should be advised to increase oral fluid-intake to two litres per day, with fluids such as water or salty soups. As with children, adults should avoid sugary or caffeinated drinks, e.g. sports drinks. Advise patients to eat normally when they feel they are able; bland foods may be more palatable initially. The recipe below may be out of date. Stir until dissolved and store in the refrigerator. The solution should be discarded after 24 hours. For further information on the management of dehydration in people with gastroenteritis, see: “Assessment and management of infectious gastroenteritis”, BPJ 25 (Dec, 2009). Notification and surveillance are key components of managing and preventing communicable illnesses in New Zealand. The data gathered from these activities guides the direction and scope of local and national public health efforts and campaigns. The list of notifiable diseases was set out in the Health Act 1956, and is available from the Ministry of Health website. Illnesses are added to the list if they are deemed important to public health, e.g. avian influenza (H7N9) and Middle East Respiratory Syndrome (MERS) were added to the list in 2013. All notifiable illnesses must be reported to the Medical Officer of Health once there is a reasonable clinical suspicion of the illness or confirmation through testing. Some illnesses, termed “Section A illnesses”, must also be reported to the local health authority, e.g. the PHO or DHB. Campylobacter, Giardia, Salmonella and Cryptosporidium are all Section A infectious illnesses. Laboratory testing is required to confirm the illness for notification. Both culture or antigen testing are sufficiently accurate for notification purposes. In addition to the standard clinical tests performed for diagnosis, additional testing may be performed by the laboratory to provide better surveillance data for some notifiable illnesses. For example, Campylobacter bacteria identified via culture may undergo multilocus sequence typing in order to provide epidemiological data.1 This information is not routinely provided to practitioners. Antibiotic treatment may be indicated for adults or children if a specific pathogen is identified by laboratory investigation (Table 2). Antibiotics are required for patients with Giardiasis and symptomatic contacts of the patient. Antibiotic treatment may be appropriate in some patients with Salmonella enterocolitis and Campylobacter enterocolitis, depending on their risk-factors. Cryptosporidium is not treated with antibiotics, as they are not effective. Antidiarrhoeal medicines are not routinely recommended and should not be used if the patient has blood or mucus in their stool.12 In people with diarrhoea containing blood or mucus antidiarrhoeal medicines increase the risk of toxic megacolon and prolong duration of diarrhoea.19 If an antidiarrhoeal is required for symptomatic relief in a patient without blood or mucus in their diarrhoea, loperamide can be considered.12 Loperamide should be given at 4 mg initially, with 2 mg after each loose stool, up to a maximum of 16 mg in 24 hours. If pain relief is required, paracetamol can be given. NSAIDs should be avoided in people with dehydration or the potential for dehydration due to the risk of kidney injury. The patient’s current medicine use should also be reviewed, as certain medicines may worsen diarrhoea (e.g. laxatives), increase the risk of complications from the diarrhoea (e.g. diuretics, NSAIDs) or can be affected by diarrhoeal symptoms (e.g. reduced absorption of oral contraceptives). Secondary, or acquired, lactose intolerance can occur following any gastrointestinal illness that affects the gut mucosa. It is particularly common in adults following Cryptosporidium or Giardia infection and in children following any enteric infection. If the patient’s diarrhoea continues following antibiotic treatment or begins again soon after symptoms cease consider lactose intolerance. A lactose challenge can be undertaken: instruct the patient to trial a lactose-free diet for two weeks, then reintroduce these foods, and report any symptoms that occur. All food containing lactose needs to be removed during the challenge, so food labels should be closely assessed. Many foods and some medicines contain unexpected lactose, such as instant soups, muesli bars and some processed meat. Secondary lactose intolerance following enteric infection is usually transitory, but may persist for several weeks.21 It can be managed with dietary restriction followed by gradual reintroduction of milk. Irritable bowel syndrome may also develop following a significant enteric infection. Symptoms and signs will be similar to lactose intolerance; however, a lactose challenge will usually be negative. Irritable bowel syndrome may be short-term or may persist for several years. Management usually involves reassurance, stress management, lifestyle and diet changes and, in some patients, medicines such as loperamide and mebeverine. For further information on lactose intolerance, see: “Investigating the gut: Lactose intolerance”, Best Tests (Mar, 2010). For further information on irritable bowel syndrome, see: “Irritable bowel syndrome in adults: not just a gut feeling”, BPJ 58 (Jan, 2014). Symptomatic contacts should be managed based on their risk-factors and the severity of their illness.3–6 For example, if they are a food handler or have a rural occupation, investigation may be required. If no risk-factors are present, investigation is not routinely recommended. A “probable” notification can be made based on contact with a confirmed case, without laboratory, testing if necessary. Treat if severe,* symptoms present for more than one week, women who are pregnant nearing term or people who are immunocompromised. Treatment may also be appropriate for food handlers, child care workers or people caring for immunocompromised people. Metronidazole can also be used first-line. Children – 30 mg/kg, once daily, for three days, to a maximum of 2 g per day. If treatment with ornidazole appears to be ineffective, exclude re-infection from asymptomatic contacts; lower doses of metronidazole may be given for longer periods, e.g. 10 mg/kg/dose, three times daily for children or 400 mg, three times days, for seven days. An interval of two to three days between treatments is recommended. Ornidazole is only available in tablet form, which may be crushed. A child dose is equivalent to one-quarter of a tablet per 3 kg. Thank you to Dr Rosemary Ikram, Clinical Microbiologist, Christchurch for expert review of this article. McBride G, Ball A, French N, et al. Campylobacter in food and the environment: examining the link with public health. 2011. Available from: www.foodsafety.govt.nz (Accessed Feb, 2014). Environmental Science and Research (ESR). New Zealand public health surveillance report: December 2013. 2013.Available from: https://surv.esr.cri.nz/surveillance/NZPHSR.php?we_objectID=3880 (Accessed Feb, 2014). Ministry of Health. Communicable disease control manual - Campylobacteriosis. 2012. Available from: www.health.govt.nz (Accessed Feb, 2014). Ministry of Health. Communicable disease control manual - Salmonellosis. 2012. Available from: www.health.govt.nz (Accessed Feb, 2014). Ministry of Health. Communicable disease control manual - Cryptosporidiosis. 2012. Available from: www.health.govt.nz (Accessed Feb, 2014). Ministry of Health. Communicable disease control manual - Giardia. 2012 .Available from: www.health.govt.nz (Accessed Feb, 2014). Environmental Science and Research (ESR). New Zealand public health surveillance report: September 2013. 2013. Available from: https://surv.esr.cri.nz/surveillance/NZPHSR.php?we_objectID=3880 (Accessed Feb, 2014). Queensland Health. Shiga toxin-producing Escherichia coli (STEC) infection. 2013.Available from: www.health.qld.gov.au/cdcg/index/stec.asp (Accessed Feb, 2014). Ministry of Health. Verotoxin- or Shiga toxin- producing Escherichia coli (VTEC/STEC). 2012. Available from: www.health.govt.nz (Accessed Feb, 2014). Casburn-Jones A, Farthing M. Management of infectious diarrhoea. Gut 2004;53:296–305. Reisinger E, Fritzche C, Krause R, et al. Diarrhoea caused by primarily non-gastrointestinal infections. Nat Clin Pr Gastroenterol Hepatol 2005;2:216–22. National Institute for Health and Care Excellence (NICE). Clinical Knowledge Summaries: Gastroenteritis. 2009. Available from: http://cks.nice.org.uk/gastroenteritis#!topicsummary (Accessed Feb, 2014). District Health Boards Shared Services. Laboratory test schedule. 2013. Available from: www.dhbsharedservices.health.nz (Accessed Feb, 2014). District Health Boards Shared Services. Laboratory test guidelines. 2013. Available from: www.dhbsharedservices.health.nz (Accessed Feb, 2014). McHardy I, Wu M, Shimizu-Cohen R, et al. Clinical laboratory diagnosis of intestinal protozoa. J Clin Microbiol 2013;[Epub ahead of print]. Wright S. Tropical diseases: Protozoan infections of the gastrointestinal tract. Infect Clin N Am 2012;26(2):323-9. Lee S, Surawicz C. The management of infectious diarrhea. Medscape Gen Med 2001;3(4).DOI 407978. National Institute for Health and Care Excellence (NICE). Diarrhoea and vomiting in children. NICE, 2009. Available from: www.nice.org.uk (Accessed Feb, 2014). Nwachukwu C, Okebe J. Antimotility agents for chronic diarrhoea in people with HIV/AIDS. Cochrane Database Syst Rev 2008;4:CD005644. New Zealand Formulary (NZF). NZF v20. 2013.www.nzf.org.nz (Accessed Feb, 2014). Slack A. Parasitic causes of prolonged diarrhoea in travellers: Diagnosis and management. Aus Fam Physician 2012;41:782–6. Rhys Faavae said: 22/07/2016 8:06:24 p.m. The Editor said: 24/03/2017 8:50:35 a.m.
Justin Pratt said: 6/02/2018 12:05:35 p.m.